Uropathogenic E. coli (UPEC) are intracellular pathogens with a complex life cycle. 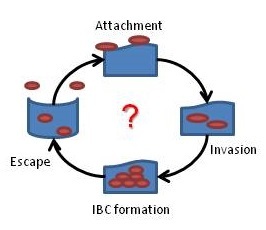 After entering the bladder cell host via an endocytic process, the bacteria escape the endosome a prolifer ate rapidly in the cytoplasm forming an Intracellular Bacterial Community (IBC). While these IBCs have been observed in animal and human UTIs, they are not easily recapitulated in tissue culture models. The inability to form IBCs in vitro is often attributed to the fact that the standard lab bladder cell lines are tumor-derived and do not faithfully mimic the fully differentiated umbrella epithelial cells which line the bladder in vivo. While it is certainly true that gene expression patterns between cell lines and in vivo tissue are different, it is also true that the physical/mechanical environment of tissue culture is distinct from the physiological environment. Using hydrogels as a culture substrate, our lab is investigating how tissue mechanical properties influence the intracellular behavior of UPEC. Bacteria are able to adhere to a wide variety of surfaces, both biotic and abiotic. For many bacterial pathogens, attachment to host tissues is a critical first step in the infection cycle. Our lab is interested in understanding how adhesion and mechanical forces control bacterial gene expression and virulence. One of the primary structures involved in E. coli adhesion is the type-1 fimbriae. These fimbriae are extended from the outer-membrane and specifically adhere to mannose sugars. For uropathogenic E. coli (UPEC), the ability to bind mannose allows these bacteria to adhere to mannosylated uroplakin proteins on bladder epithelial cells. The biophysics of type-1 fimbriae is interesting in that it uses a catch-bond mechanism to regulate affinity. 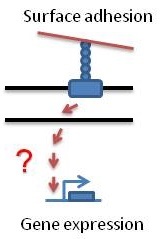 As tensile force is applied across the fimbriae, a conformational change occurs to increase substrate affinity. This mechanism allows UPEC to withstand the high fluid shear forces in the bladder. To understand how fimbriae transduce mechanical cues to regulate bacterial behavior, our lab uses a multidisciplinary approach spanning traditional bacterial genetics, next-generation RNA expression profiling (RNAseq), and experimental biophysics (microfluidics and atomic force microscopy). Bacteria grow in a variety of cell shapes and often, these shapes can be dynamically regulated. In the case of Caulobacter crescentus, a long polar stalk is elongated in response to phosphate starvation. Despite decades of research, the composition of the stalk and the enzymes required for its synthesis remain unknown. Our lab is using genetic, microscopic, and mass spectrometry techniques to unravel the mechanisms of stalk elongation. Our lab is currently investigating how adaptation to phosphate starvation leads to changes in peptidoglycan organization, lipid synthesis, and metabolism. In addition to our targeted approaches, we have isolated a set of stalk-elongation mutants that we are characterizing in an effort to dissect the molecular pathways required for stalk synthesis. Page last updated at 12:21 pm January 25, 2019 . This page was printed from ericklein.camden.rutgers.edu/ on Sunday, April 21, 2019.